Easy homemade pork chops are perfect for a quick dinner. Do not let pork chops seem like they are too difficult to make. You can easily make homemade pork chops with this recipe in about 20 minutes. There is nothing like a plate of homemade pork chops. I can remember growing up and my Mother setting a down a plate of freshly made pork chops for dinner. So often she would make gravy, and it made for a favorite meal of mine. These pork chops are pan fried with a breading that will remind you of a chicken fried steak. My family is from the Mid West, and their pork chops were a mainstay of the dinner table. We were always looking for a good recipe for pork chops, but this one is my favorite way we made them at home. We always used cuts with the bone in, they are often less expensive, but they also give the meat a richer flavor. I typically buy the family pack of pork chops at the grocery store. Typically they are a good value, and you get a variety of chops. I also do not trim the fat off until after cooking. I think the fat gives the meat a bit more flavor, but you can always trim after cooking. Nowadays chops typically are well trimmed when you buy the pork chops. Season the meat before you cook it. You should always season meat prior to cooking for optimal flavor. Seasoning afterward never seems to have the impact it does when you season prior to cooking. We are starting this recipe with a homemade seasoned flour. By starting out with your own homemade seasoned flour you can customize your seasoning blend anyway you like it. I like to use cayenne pepper, paprika, garlic salt, garlic powder, and some mustard powder. I use the two types of garlic because I think they both add a nice touch to the seasoned flour. If you like your dish spicier you can add some additional cayenne pepper. You may like to add some onion powder or even some black pepper to this seasoned flour for this pork chop recipe. 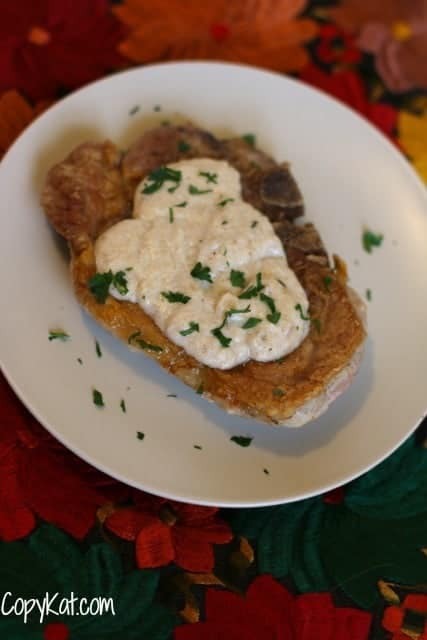 Porkchop gravy is easy to make. Do not like making gravy intimidate you. This recipe uses the pan drippings from the cooking of the pork chops. We are going to measure out the pan drippings, and we are going to add some flour and allow this to cook. We will allow this to cook for a few moments before we add the milk. By cooking the flour and pan drippings together you will get a rich flavor. We will slowly add in the liquid over a medium heat, and then we will add additional liquid when the last addition is absorbed. You may want to season your gravy with some additional salt and pepper before serving. It's so easy to make tender and juicy pork chops. Prepare seasoned flour by combining 2 cups of flour, cayenne pepper, paprika, garlic salt, garlic powder, and mustard powder. Stir to combine seasoned flour and mix well. Season pork chops with a salt and pepper. Heat 2 tablespoons shortening in a large skillet over a medium-high heat. Dredge pork chops on both sides with seasoned flour. Shake off excess flour. Place breaded pork chops into the pan, do not overcrowd if they will not all fit. Cook for 3 to 4 minutes on each side (the thicker the pork chop the longer it will take to cook), and check for doneness. Pork should not be served rare. Set pork chops on a wire rack or paper towels to drain. Prepare gravy by measuring amount of shortening is left in the pan, if you need to add some more, you can. Start with 2 tablespoons of pan drippings, add 2 tablespoons of flour. Stir to combine. Cook this flour paste for 1 minute. When it begins to smell like pie crust, you can add 1/2 cup of whole milk. Stir to combine, when the flour mixture turns into a uniform paste, add an additional 1/2 cup of whole milk. Stir until the milk is incorporated into the gravy. Add the remaining 1/2 cup of milk to the gravy and stir to combine. Taste gravy for seasoning, you may want to add some additional salt and pepper. I like to use bone in rib chops. First I score the fat along the meat side. Just slice from outside down towards meat but not into the meat. I then season my chops with seasoned salt, garlic powder and black pepper. I cook them in a frying pan with a small amount of oil. Great suggestion Helen on slicing of the fat, I bet the seasoning really gets worked in this way.